New Item! Expected to Ship 05-31-2019. Reserve yours today - No charge until it ships. This portable bass combo delivers for all your practice needs. 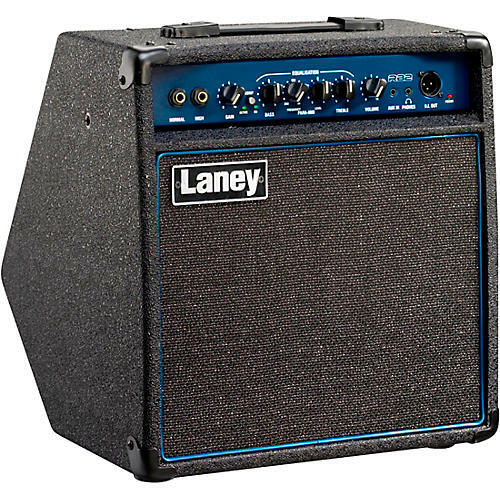 The Laney RB2 is a 30 Watt RMS kickback design bass combo, loaded with a custom-designed 10" driver and horn. Suitable for the bedroom, recording or rehearsal. The RB2 delivers 30 watts RMS of solid bass power. Coupled with both a 10” custom designed driver and a high frequency horn the full range of bass tone can be heard with clarity and definition. The RB2 features a dual-position cabinet design so can be used as a conventional stage combo or in "kickback" position as a monitor. The RB2 pre amp features High and Normal jack inputs – catering for active and passive basses and a powerful 3 band EQ featuring a swept mid control making accurate tonal shaping a breeze. A switchable compressor adds instant punch. As well as headphone socket for silent practice and Aux input for audio playback, an XLR DI socket allows the RB2 to be connected directly to a PA system or recording console. Dimensions: 15.86" x 12.12" x 12.83"